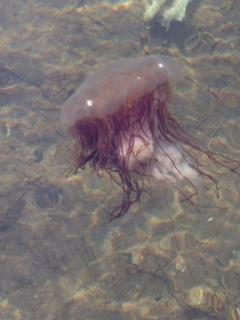 Earlier this month there was a notable increase in jellyfish sightings in southern Maine waters. The reason for this phenomenon is not entirely clear, say scientists, but it's prompting some of the state's hardiest swimmers to think twice before jumping in the water. Tom Porter reports on jellyfish. Carrie McCusker, an endurance athlete and coach from Cape Elizabeth, says she saw unusual looking jellies last week, just a short boat ride from the South Portland marina toward Peaks Island. The creatures have since disappeared, but McCusker, who says she has been swimming in these waters her whole life, says they were here in large numbers. McCusker: "We were out taking a little pre-dinner ice cream run to Peaks, and we went out to the back side of Long Island and stopped, and it was very calm and we were floating and my daughter and her friend were suddenly spotting jellyfish floating around. So they actually took one of the boat hooks and were stirring up the water and then we started spotting a whole bunch." Tom Porter: "What did they look like?" McCusker: "Some were about the size of your hand spread out and clear, and then others were about 6-7 inches across and kind of bell-shaped and almost a little bit purplish in color. That's what we saw by Long, and then by Peaks we saw one that was orange, and they're vibrant and they have quite a few tentacles." Chris Taylor of Scarborough also witnessed the presence of jellies. "Someone started emailing our swim group saying, 'Hey look out for some of the jellies in the bay,' so I chimed in as well saying 'Oh yeah I've seen them too,' and this is the first time I can remember seeing them," he says. Taylor's sighting occurred earlier this month, as he was kayaking up the Scarborough River toward the sea. "And I just started noticing large jellyfish at first, and I was like 'Wow, those are pretty big,' and then noticed that they had these long tendrils and I saw one and I thought that was odd," Taylor says, "and saw more and more of them, so that was kind of concerning. And I started thinking to myself, 'I wonder how long those tendrils are.'" Taylor pulled his kayak — which is 17 feet long — up alongside to see check the size, and found the tendrils were at least as long as the boat. So how unusual are these sightings? Andrew Pershing is chief scientific officer at the Gulf of Maine Research Institute. "It's really hard to say what's typical when it comes to jellyfish, they're a kind of organism that we don't sample very well, so we just really don't have good baseline data to say whether this is unusual or not," Pershing says. The term "jellyfish" is very broad, he says, and refers to a variety of sea life described as "gelatinous zooplankton." Regarding the recent sightings in Casco Bay, Pershing says the smaller ones are most likely the types known as ctenophores, or "comb jellies," and aurelia aurita, known as "moon jellies," both of which offer little or no "stinging threat" to humans. The larger more brightly colored ones with long tentacles, he says, are probably the species known as Lion's Mane jellyfish, which can give an unpleasant sting. "What's so fascinating about the jellyfish is that they're plankton right?" Pershing says. "So they get pushed and pulled by the current so they're not there, and then all of a sudden they're there." Couple this with the fact that ocean-monitoring buoys identified a big pulse of warm water flowing into the Gulf of Maine earlier this month, and he says you have one possible explanation for the sudden appearance of jellyfish. A similar proliferation occurred two years ago, he says, during the warmer-than-usual summer of 2012. More widely, some scientists argue that jellyfish are becoming increasingly pervasive globally because they're better suited to withstand changes in the ocean environment. "There's something out there called the 'Jelly Oceans Hypothesis,'" says Nicholas Record, a senior research scientist at the Bigelow Laboratory for Ocean Sciences in Boothbay. "Some scientists have hypothesized that we're shifting toward an ocean that's dominated more by gelatinous species rather than things like fish. And there are a variety of causes from over-fishing, to low oxygen, things related to pollution, but that hypothesis is debated." Something that all ocean scientists agree on however, is the need to learn more about jellyfish. In the meantime, endurance athlete McCusker says last week's sighting has chilled her enthusiasm for swimming in Casco Bay. Porter: "What do you make of this? Are you a bit reluctant to go back in?" McCusker: "Yes. Actually, the biggest one was floating by the Peaks Island pier, which is where we always jump off, so I'm not going in." Later this month a special commission will convene in Maine to study ocean acidification and look for ways to mitigate it. It was established by legislation passed in April, making Maine the first state on the East Coast to enact a law specifically to study the threat posed by the changing chemistry of the seas. The lawmaker behind the measure says ocean acidification is a problem he witnesses on a daily basis.